<!–[if !mso]> <! [endif]–>A broad coalition of groups supporting Palestinian rights is sponsoring a Sept. 15 march on the United Nations. The demands of the New York City march are: Sovereignty Now! Enforce the Right of Return! Full Equality for All! End All U.S. Aid to Israel! End the Occupation! Support Boycott, Divestment and Sanctions! The date was chosen because that is when Palestinian Authority Mahmoud Abbas has said he will call for a UN vote on “recognition” of Palestine—more precisely, of a bantustan, an artificially-segmented “state” on a discontinuous fraction of the 22% of historic Palestine represented by the West Bank and Gaza. But despite the inadequate nature of what Abbas is calling for, and the likelihood that he’ll back out of calling for a vote at the last minute due to U.S. and Israeli pressures and promises, supporters of Palestinian self-determination are taking advantage of the media attention to launch their own rally. Millions of Palestinians around the world are watching these events with a keen eye to using them to intervene on their own behalf with their own demands. Abbas, as well as UN Envoy Riyad Mansour and jailed Fateh leader Marwan Barghouti, have called for mass mobilizations in Palestine to back their diplomatic moves. Once again, we can have no confidence that these calls will be carried out. But leading Palestinian activists are taking full advantage of the discussion that has mushroomed as a result of the PA initiatives. They do so with the increased self-confidence of Palestinians worldwide as a result of the May and June Marches for Return to the borders from Syria, Lebanon, and elsewhere—and Israel’s increasing isolation. The organizers of the UN protest have made clear they do not support Abbas’ diplomatic “solution,” and the demands of the rally reflect this independent character. Palestinians in the United States are also seizing this opportunity to step up momentum around the Palestinian Movement Assemblies called by the U.S. Palestinian Community Network. The PMAs are local gatherings of Palestinian communities intended to let them come together to articulate their demands, and to organize support for the right of Palestinians all around the world to participate in direct, long-overdue elections to the Palestine National Council. Only such elections, and the mass mobilizations and community organizing needed to win them, can bring onto the world stage a Palestinian leadership who, rather than promoting diplomatic two-state sellouts, will press for the full range of Palestinian needs and rights. Socialist Action urges all of our readers to build Sept. 15, and to support the activities of USPCN and its affiliates. For more information, e-mail palestineun@gmail.com. 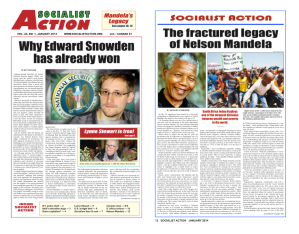 > The article above is an editorial that first appeared in the August 2011 print edition of Socialist Action newspaper. Palestine: ‘Statehood’ or liberation struggle?